Are dependent investors more conservative in their investments becausee they are dependent, or are conservative investors more likely to be dependent upon their advisor because they are conservative investors? The question is not actually asked in the study, so it is not actually answered. But the research shows that investor who are more dependent upon their advisor are more likely to be more conservative in their investment strategies. Advisor Relationships and Changing Advice Requirements segments investors from different wealth segments by age, wealth level within their segment, occupation and advisor dependency. The advisor dependency category asks investors if they are Self-Directed (with minimal advisor involvement in investing strategies), Event-Driven (using advisors only when life events warrant it), Advisor-Assisted (making their own decisions with a good deal of advisor input) or Advisor-Dependent (fully dependent on the knowledge of the advisor). Segmenting investors in this fashion tells advisors how they need to interact with investors based on how much control the advisor has over the account. While advisor-dependent investors are likely to spend more money on services than an Event-Driven investor, those less dependent investors are likely to be a little more courageous in their investing strategies, which could benefit advisors when they are involved. Among Millionaire investors with a net worth between $1 million and $5 million, 88 percent of those investors who are Advisor-Dependent consider themselves either moderate or conservative investors in terms of risk allowance. That is in contrast to the Self-Directed or Event-Driven Millionaires; 33 percent of Self-Directed investors are either aggressive or very aggressive in terms of risking investable assets, while 35 percent of Event-Driven investors are either aggressive or most aggressive. The question remains whether investors become less aggressive as they become more dependent upon advisors, or whether working with an advisor makes an investor less aggressive. It’s something for advisors to consider when a new client joins the firm and brings an aggressive attitude toward investing. Is that attitude supported or dampened? 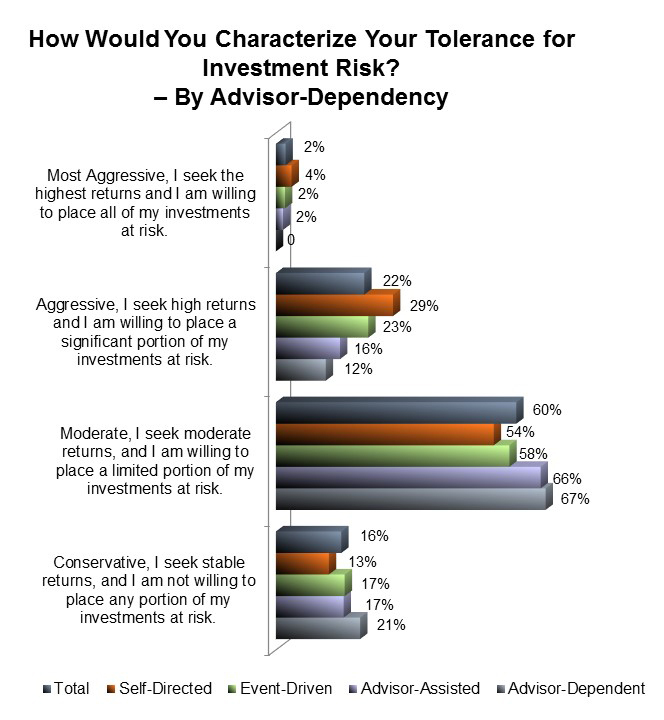 Advisor-Dependence also has a huge role in terms of investor satisfaction with advisors. Overall satisfaction among Millionaires ranges from 94 percent (Advisor-Dependent) to 55 percent (Self-Directed). The question comes up whether investors who use advisors sparingly would be more satisfied if they expanded their use. Advisors should also note that dependent investors are more likely to recommend their advisor to others. It’s not 100 percent, but it is high; 75 percent of Advisor-Dependent investors have recommended their client to others, while only 34 percent of Self-Directed and 43 percent of Event-Driven investors have done so. Advisor-Dependence of an investor changes over time. The older the investor, the more likely they are to become more dependent on their advisor. Therefore, when working with an investor who avoids advisors generally, remember that there will be a day when they might become needier for advisor services, and they will look to you for that assistance if you work well with them when they are in independent mode.